WTOP Garden Editor Mike McGrath has tips for fending off squirrel invaders, talks about what birds really need from you this season and advises you on what to do with your freshly harvested garlic crop. Yes, Chris — and the tomato cages I always urge people to make provide great tomato support as well as protection from evil squirrels! Get a roll of welded-wire animal fencing. It may be called “rabbit wire” or “turkey wire,” not chicken wire. That stuff is too flimsy. Use wire cutters to cut it into 6-foot (linear) lengths. Roll each 6-foot length into a tubular form, which will be about 2 feet across the top. Secure the ends firmly. If you cut one box in toward the end and leave the next box whole when you make the 6-foot lengths, you’ll have pre-placed “twist-ties” to hold it all together. Place this cage over the plant and then stake the cage to hold it firmly in place. Do not stake the plant itself; you want it to roam freely inside the cage. Finally, cut up some of the leftover fencing to make covers for the top of each cage and secure them with twist-ties. Easy access for you, no access for the squirrel. Chris in Forestville got poor results when he used a granular animal repellent to try and keep evil squirrels off his tomatoes. No surprise there, Chris — you’ll need to use a nasty-smelling liquid repellent that the evil squirrels would taste when they bite into your love apples, which could ruin the taste for you. Instead, get a motion-activated sprinkler. They’re widely available under brand names like “The Scarecrow” and “Orbit.” Install a battery in the device, hook it up to your garden hose, aim it at your tomato patch, and turn up the water to “full blast.” Then wait — until the evil squirrels, deer, or that notorious dog from next door come close, only to be warded off with a burst of cold water. It works every time. Sure, you might accidentally get sprayed by your own defense system every once in a while, but it’s a small price to pay for tomato protection! In all seriousness, the only thing birds need from us at this time of year is fresh water. Food for birds is abundant in the wild, and that includes pest insects in your garden. Feed seed to birds now and they’ll hunt for fewer, if any, garden pests. And as we stressed a few weeks ago, birdseed can also attract mice, rats, voles, evil squirrels and other vermin. Seed feeders are always going to attract vermin like mice, rats, voles and evil squirrels, perhaps even more so in the winter, when natural food is scarce. That doesn’t mean you shouldn’t feed birds in the winter; I certainly do! Starting around September, I hang a dozen suet feeders around my garden and front yard. The cakes of suet provide a high energy food source for the birds — a lot more calories than birdseed — but don’t attract pests. Take down the suet feeders when the weather gets warm, fill up some birdbaths, and I suspect you’ll have more birds than ever swooping in to eat your bad bugs. Have you thanked your garlic today? Did you plant garlic back in the fall like I told you to? If so, I hope you have already harvested your heads. If you haven’t, get out there and pull them up now! Let them sit out at room temperature — preferably under a ceiling fan — for a week to “cure” and then use any damaged heads right away to make a super-garlicky dinner. As you break open the remaining heads over the next month or so, save the biggest and best cloves for replanting when the kids go back to school. 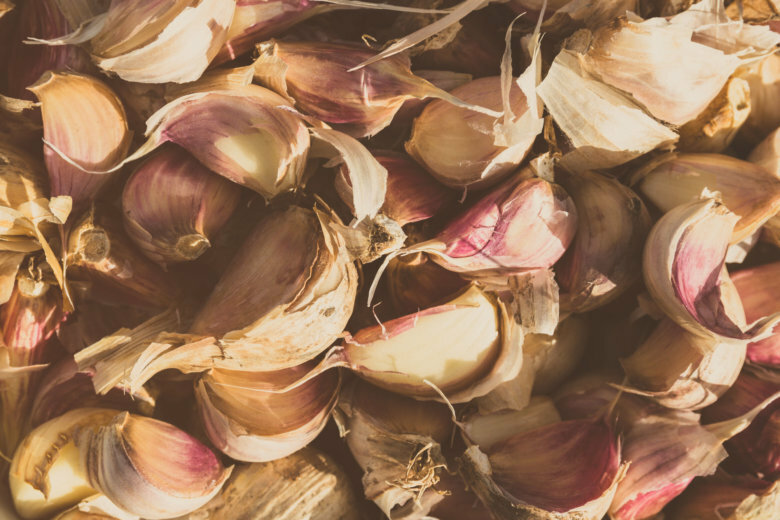 If you have lots of nice garlic, slice, dry and grind your extra cloves to make the world’s finest garlic powder for continued good-quality garlicky flavor over the winter. And make use of that empty garden space by planting bush beans; you’ll have perfect little string beans to pick by the first or second week of September!